12 Easy Cooking Techniques That Will Teach You How To Cook 1000's Of Whole Food Meals! 50 Videos. 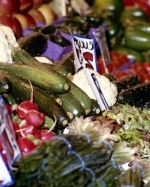 Many Experts say the average family throws out nearly 15 percent of all fresh foods they purchase each year. This is depending upon where you live and the time of year, that could add up to quite a bit of money. It is very important to find ways to store fresh food for longer. Here are seven ways to accomplish this. Let's Be Thankful On Thanksgiving And Remember That We Are Blessed!